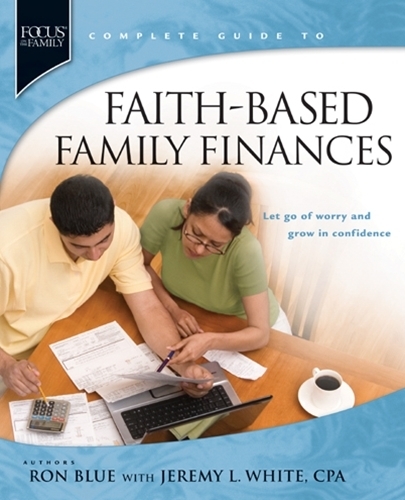 The Complete Guide to Faith-Based Family Finances could be described as "the bible" of Christian financial management. Author Ron Blue describes his 600-page book as "by far the most comprehensive financial book I've ever written" - which says a lot considering he is a nationally recognized author of 13 books. With the help of co-author and CPA Jeremy White, Faith-Based Family Finances is a compilation of Blue's 30-plus years of wisdom and experience as one of America's most respected financial advisors. Faith-Based Family Finances is unique from other money management books - Christian and secular - in that it aims to take the reader far beyond solving a specific financial problem in their life, such as getting out of debt. Rather, it is a "book of encouragement to those who want a proper perspective and plan for managing resources entrusted to them by God," says author Ron Blue. The aim, he says, is to give the reader more contentment, less stress about their financial future, and to help them leave a financial and spiritual legacy. Also notable are the endorsements this book received from trusted national Christian leaders. A few examples: Dave Ramsey praised Ron Blue's unique understanding of God's way of handling money. Chuck Colson described Blue's book as a "solid, biblical view of financial planning." Family Life president Dennis Rainey praised Faith-Based Family Finances for being "comprehensive." And Pastor Andy Stanley predicted this book will be a "resource families will turn to again and again." The "Big Picture" section provides a solid, biblical approach to financial decision making. The topics addressed here apply to everyone, and lay the foundation for the rest of the book, as well as the financial planning of the reader. This section also separates this book from the pack of financial advice books in that careful attention is given to the "why" of money management before the "how-to" questions are explored. The "Life Stages" section makes this book unique among Christian money management books in that it offers in-depth financial advice for various stages in the reader's life cycle (i.e. young couples, families, retirement, estate planning, etc.). This helpful categorization goes beyond addressing specific issues (i.e. getting out of debt) and instead integrates a long-term view, giving readers a useful resource that they can refer back to for years to come. The "Financial Topics and Strategies" offers in-depth insights on a range of "real life" issues - such as taxes, investing, insurance, and choosing a financial advisor. But once again, this book goes beyond what you would expect to see in a typical money management book and offers practical, biblical wisdom on topics such as giving until it feels good, communicating more effectively with your spouse about money, women's work at home and in the workplace, and financial considerations for singles. The "Bringing it All Home" section provides final thoughts on topics such as consumer protections and saving for college. Additional resources are also provided, with brief descriptions of various helps on topics such as debt, estate planning, financial planning, giving, kids, software, and more. At first glance, this book can appear overwhelming (as previously mentioned, it contains 600 pages!). The book is laid out well, however, with bite-size nuggets, stories, and graphs for easy reading. While some may attempt to read this excellent book from cover to cover, it is probably most useful as a reference guide that can be used for a lifetime.